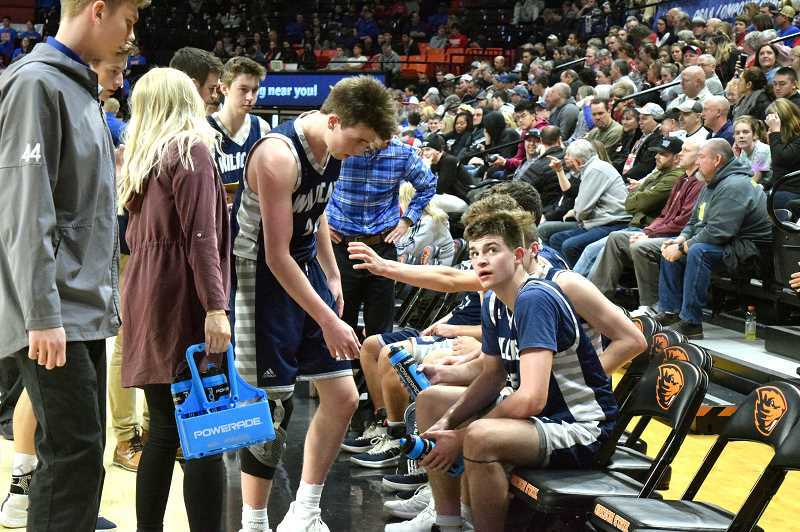 Capturing the state title put the Wilsonville boys basketball team at the very top of the 5A Oregon basketball scene, and shows their level of dominance. After all, Wilsonville put together a 27-2 record with wins over every team they played in Oregon. But that doesn't mean there weren't close shaves or games where the team wasn't pushed. The Wildcats had to dig deep for a few of their victories, and it only served to display the team's guts, grit and determination. In no particular order, let's look at five of the team's closest brushes with defeat where they managed to turn it around and nab victory. Wilsonville 66, West Linn 62: It wasn't the first time the Wildcats had tangled with a 6A team that season, and it wouldn't be the last, but the battle with West Linn certainly was the closest. The Wildcats engaged in a back-and-forth scoring affair with its school district sibling, and wound up getting the win to make it 4-0 early in the preseason. Senior Jack Roche had 15 points, junior Dakota Reber recorded 11 points, senior Zach Rivers had 10 points, and senior Nolan Thebiay had 8. Wilsonville 70, Parkrose 60: Don't let the double-digit victory fool you. Though Wilsonville walked away from its first encounter with Parkrose the winner, this was the first league contest where the Wildcats had to keep their foot on the pedal the whole way through. Parkrose came into the contest on a 13-game win streak looking to stay unbeaten in league, but coach Chris Roche and company had other ideas. Slowly, the team edged out ahead of the Broncos and sealed the deal 70-60. Senior Jack Roche led the way with 19 points, trailed by juniors Dakota Reber and Keegan Shivers with 16 and 14 points respectively, and junior Gabe Reichle with 10. Wilsonville 66, Parkrose 60: The second time through league, Wilsonville's toughest test was once again the Parkrose Broncos. One of the reasons the team found it difficult to overcome the Broncos the second time was the rebounding. Parkrose beat Wilsonville on the boards 32-20, and had it not been for the near 60 percent Wildcat shooting, things might have finished differently. This time around, junior Reber led the team with 23 points, followed by Roche with 16 and Shivers with 13. 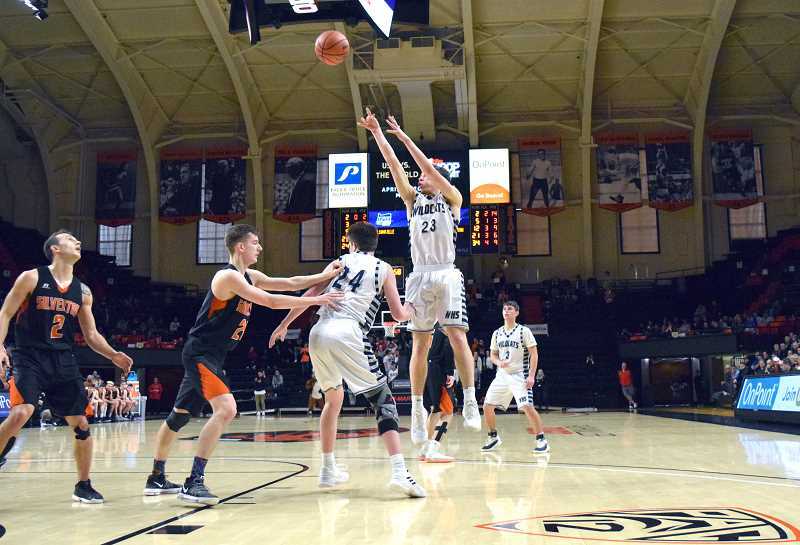 Wilsonville 50, Silverton 45: In the penultimate game of the season, Wilsonville squared off with the ever-dangerous Silverton Foxes with a spot in the state finals on the line. The two powerhouses did not disappoint. In what turned into an inside grind, both teams battled hard in the paint for each point. The Wildcats recorded 18 of their 19 field goals from inside the arc. Leading the team that night were juniors Reber and Shivers with 30 cumulative points, with Roche trailing the duo with 12 points. Wilsonville 67, Churchill 58: In what would net the school its fourth boys basketball title, Wilsonville went up against the No. 1-ranked Churchill squad at Gill Coliseum in front of a raucous crowd. Both teams managed 21 field goals, but it was the Wildcats shooting from the free throw line that secured the deal, as the team nailed 21-of-26 attempts. Senior Jack Roche also set a state record, recording 13 assists in the process. Reber had a monster game, notching 21 points with nine rebounds, while Shivers had yet another double-double, 12 points and 11 rebounds.